See that tiny dark speck in the middle of the photo? 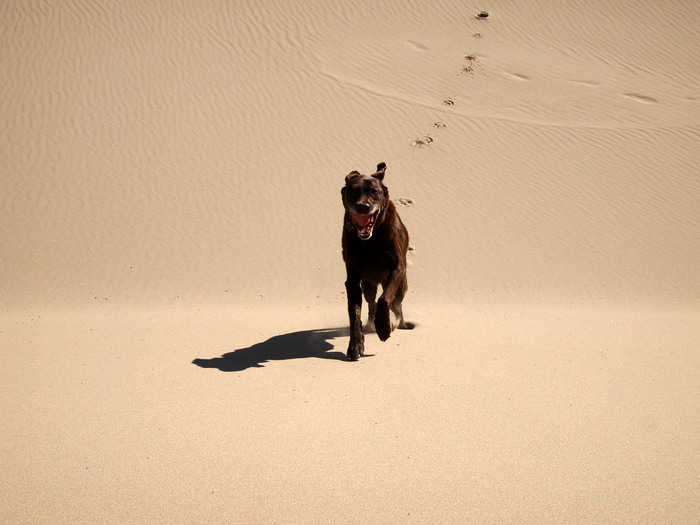 That’s Phineas enjoying a romp through the Oregon sand dunes. 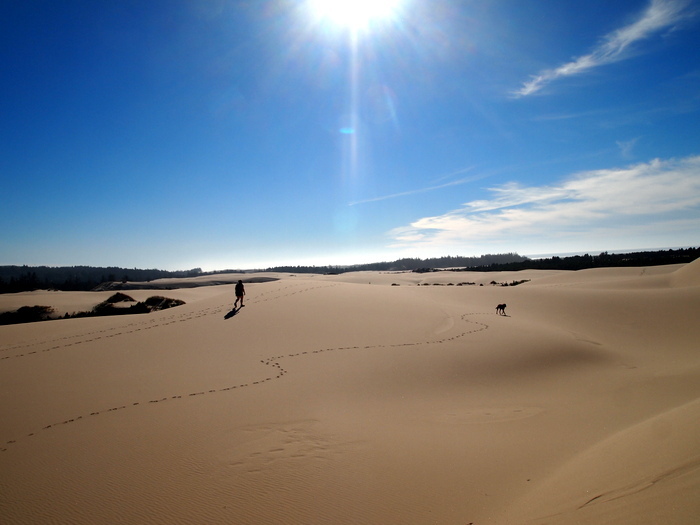 When we set off to explore the largest expanse of coastal dunes in North America we hoped to find an endless sea of sand sculpted by the wind, with views of the ocean and surrounding mountains. We found this and so much more. 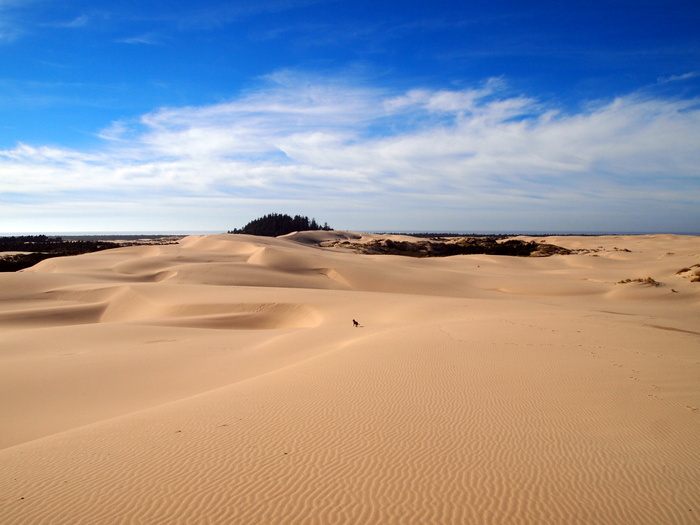 The Oregon Dunes National Recreation Area stretches about 40 miles along the coast from Florence to Coos Bay and is known as a paradise for hiking, wildlife viewing, camping, horseback riding, and Off-road vehicle use. 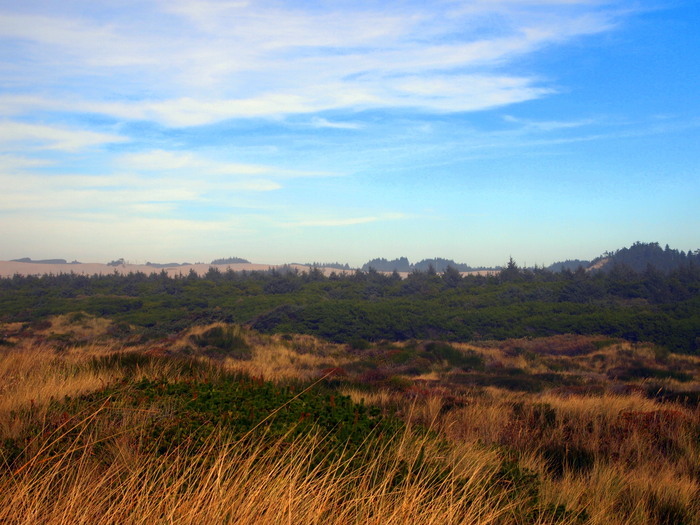 The dunes are easily accessible from one of the many view points, day use parks or trail heads along Route 101. 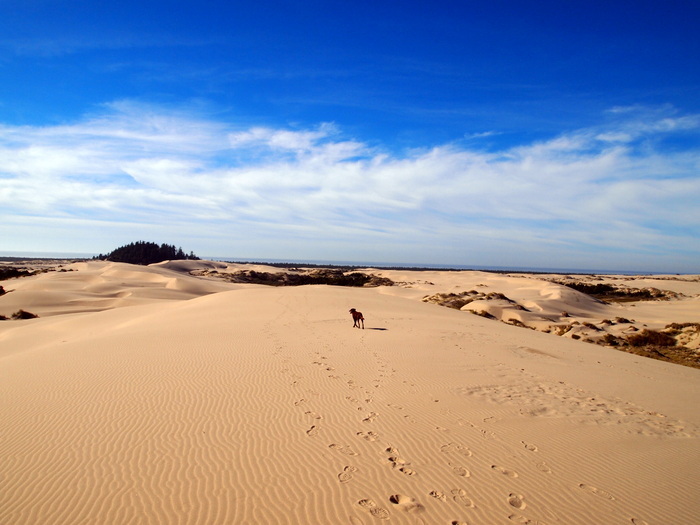 We chose to hike the Umpqua dunes trail which starts in the parking lot of Eel Creek campground (where our National Park pass once again came in handy, otherwise it costs $5/day to park here because it’s part of a national recreation area) and traverses through a quarter mile of low evergreen shrubs before opening up to a spectacular dune landscape. 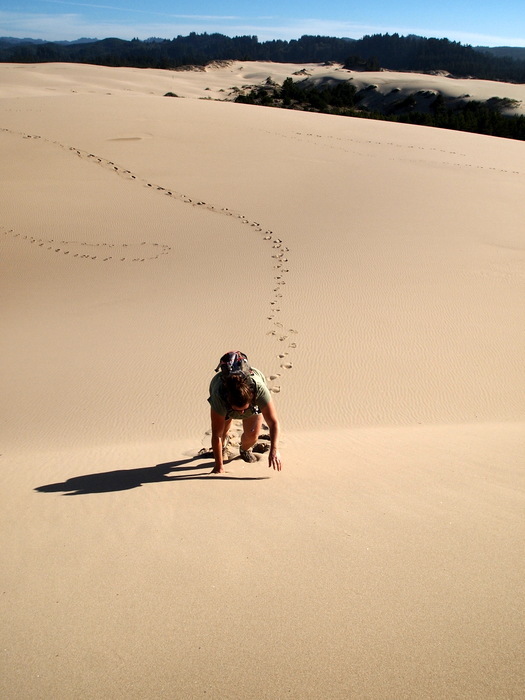 We climbed up the first huge sand mountain and were blown away by the view from the top. 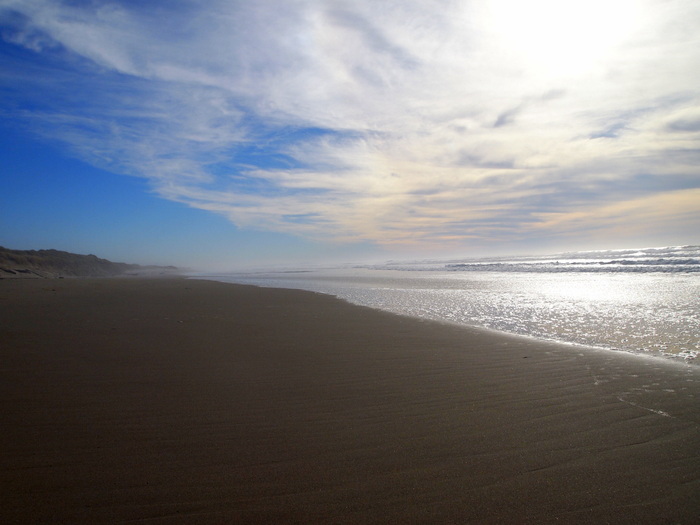 All around were waves of sand dotted with pockets of tree islands, and far off on the horizon lay the ocean. 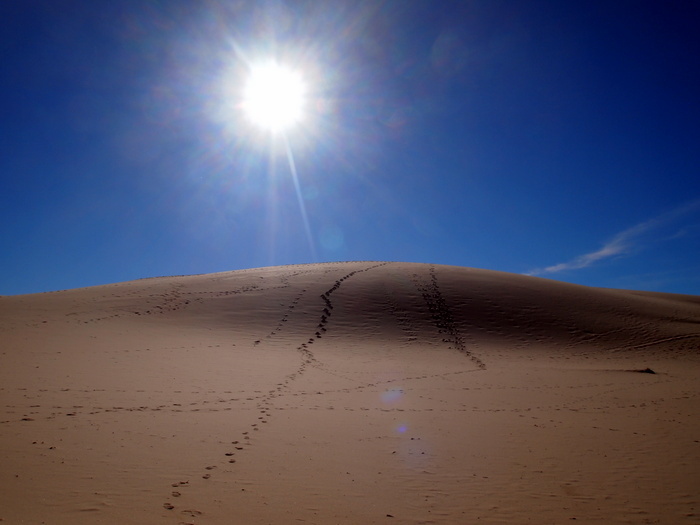 At this point the trail markers disappear into the ever changing sea of sand, but with views in every direction it’s nearly impossible to get lost. We wandered freely towards the west with the ocean shore as our destination. 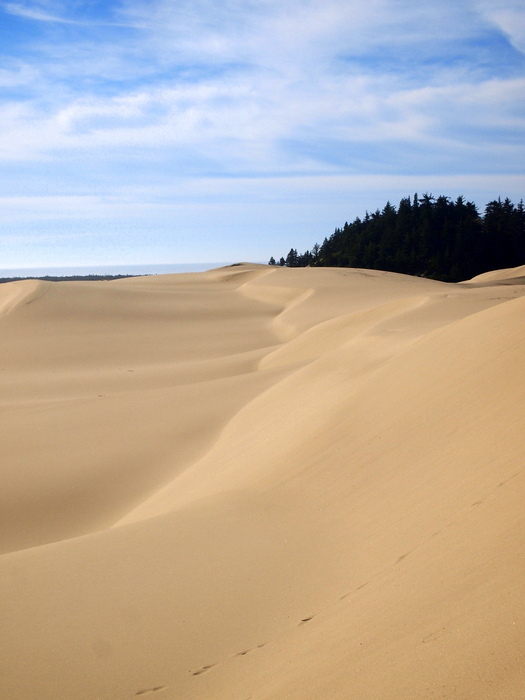 As we neared the ocean the ecology changed as the high dunes gave way to a half mile strip of dense, moist evergreen forest. 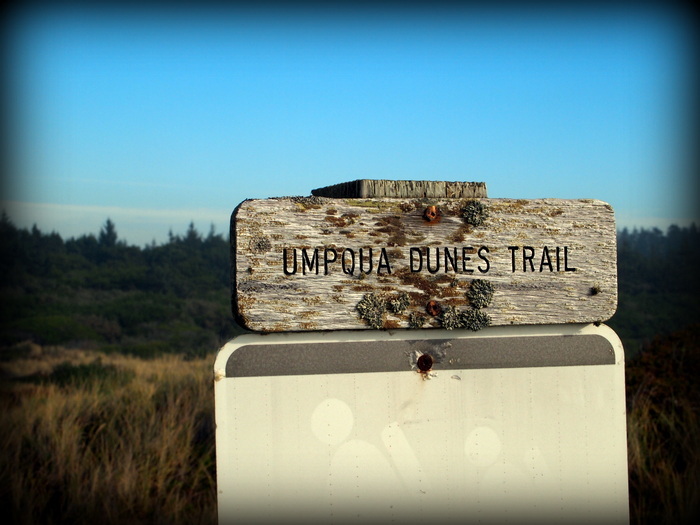 We found the blue trail markers once again and followed them through the forest to a section of low grass covered dunes, and finally a wild inhabited stretch of pristine beach. 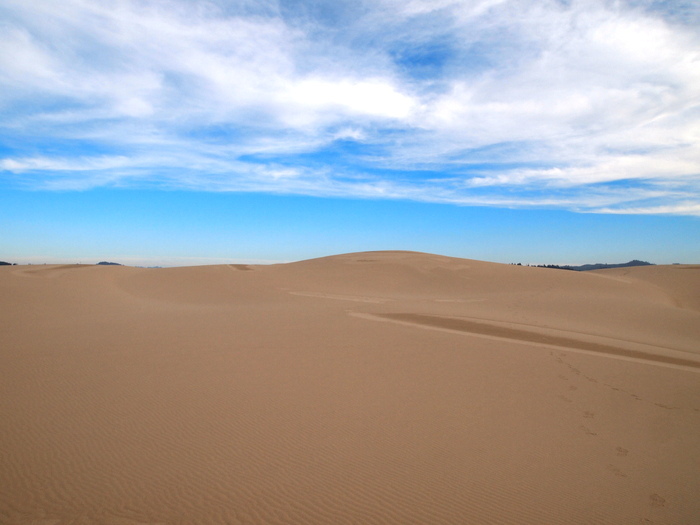 The Oregon sand dunes are one of nature’s true wonders.